May 8... I had a relatively quiet last day in Japan, and met a friend for a quick lunch while Hiromi started the first day of work after Golden Week. After lunch, I made my way to Yūrakuchō to look for some additional self-indulgent snacks and treats to bring back to Seattle. I made my way back to my usual favorite spots (Hokkaidō Dosanko Plaza, Mura-Kara-Machi-Kara-Kan) and discovered, downstairs in the same building, a shop selling Wakayama specialties and another focused on Toyama products. I ended up taking home some umeboshi, some yuzu yubeshi, and some high-powered umeshu, and a few other treasures. 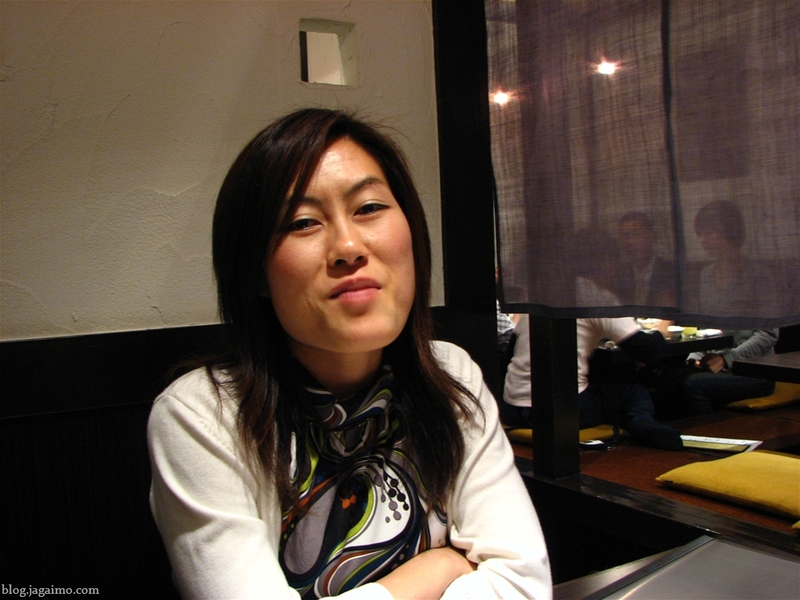 I met up with Hiromi mid-afternoon, because she had a medical appointment and had to leave the office a bit early anyway. After she finished with that, we met in Ginza and went to Printemps, where we both ordered a really nice, this-month-only, Matcha Mont Blanc. We then slowly headed back home, rested for a few minutes, and made our way to a restaurant we'd been planning to try all week. 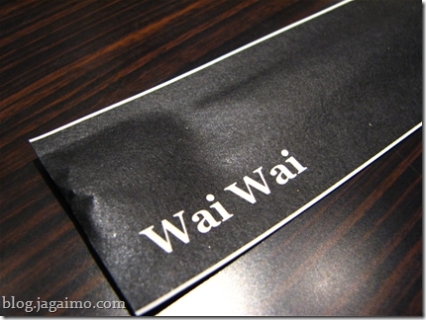 Wai Wai, or 和伊・和伊, is a Japanese-Italian Izakaya that cutely uses country-appropriate Kanji (Japan and Italy) as ateji for a word that usually means something like "noisy" or "noisily". The space looks tiny if you peek inside... There's only a U-shaped bar adjacent the kitchen, and maybe a small table or two. But it turns out that they have a half dozen or so tables upstairs, and that's where we were seated. The booths have small noren hanging to create some semblence of privacy. This was fascinating. 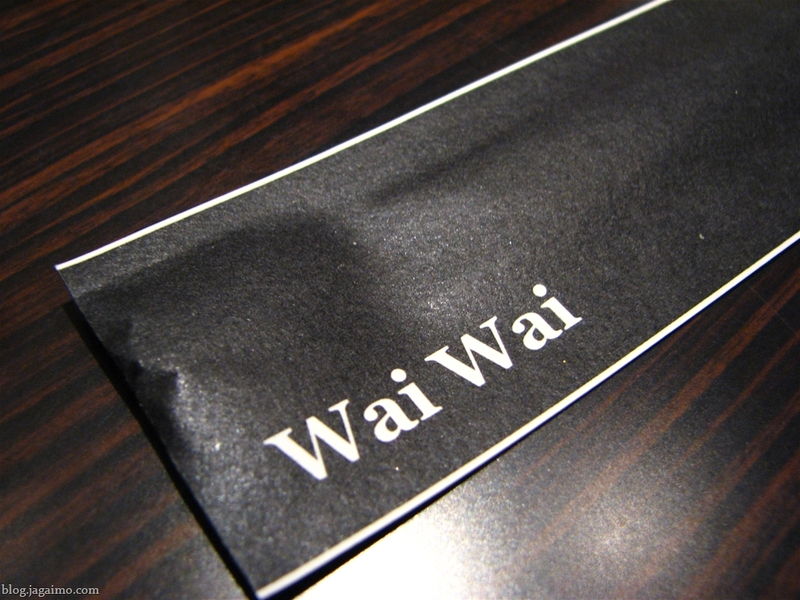 In fact, seeing this dish on the menuboard outside Wai Wai may have been what triggered us to try this restaurant. 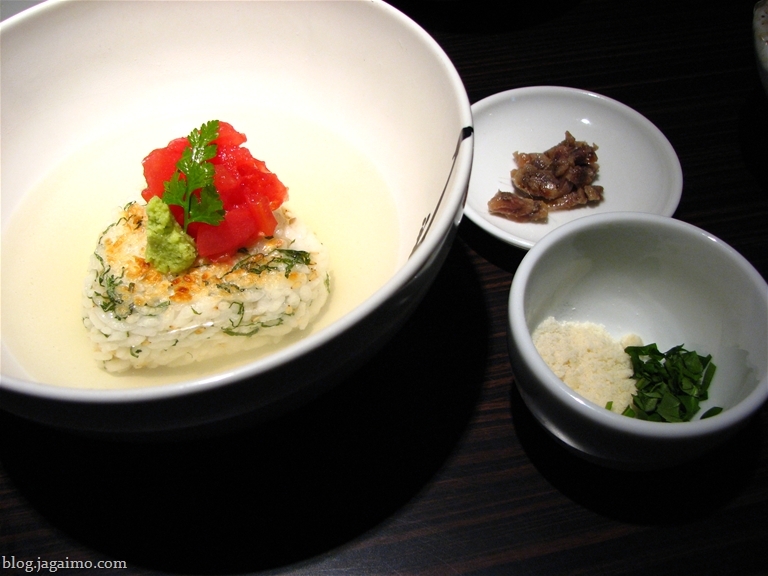 They transformed a typical izakaya dish of fried tofu in a seasoned dashijiru into a clever, but not over-the-top, fusion dish. Deep-fried basil, mozzarella, and tomato make an appearance, along with the typical agedashi accompaniments of ginger, oroshi-daikon (grated daikon), and negi. While the flavor isn't much a surprise, and any crispness quickly faded as the dish made its way to our table, the combination was quite successful. It's hard to go wrong with basil-tomato-mozzarella, and the mild broth added the same kind of complexity you'd get from parmesan or a more Italian style soup stock. This was the most Japanese of the things we ordered. 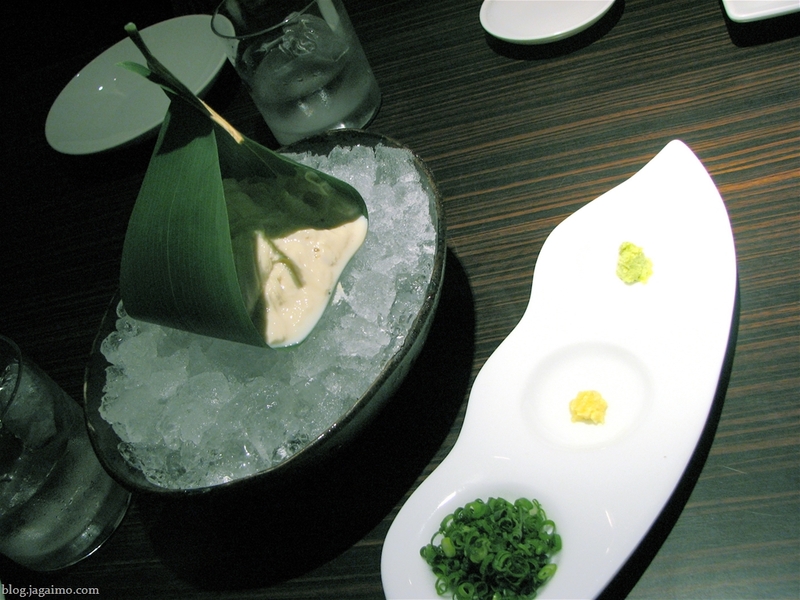 It's an elegant presentation of a simple dish: fresh yuba, made from skimming the surface of slowly simmering heavy soymilk, served with soy sauce, ginger, wasabi, and chopped scallions, which you add to the yuba to your own taste. I ate most of this, as Hiromi ordered for herself some chicken thighs, grilled with something like sansho. 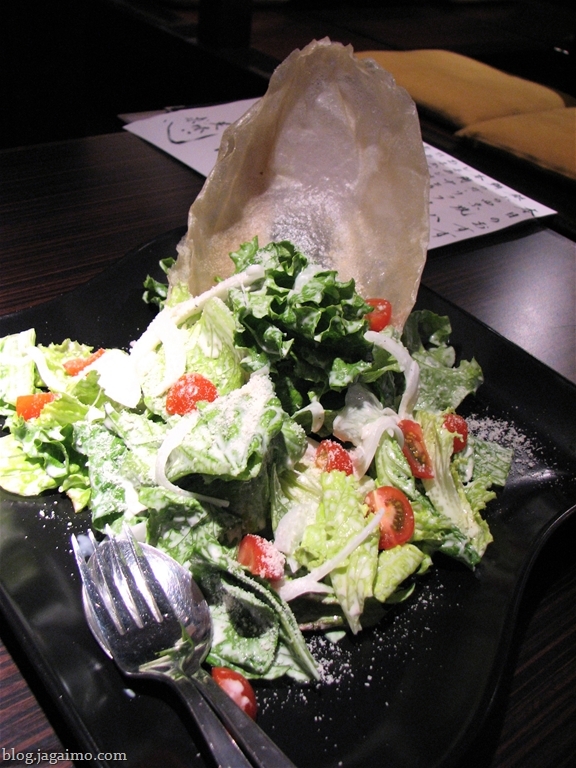 This salad replaces the typical crouton with a sculptural crispy crepe, which you're encouraged to break up and scatter over the salad. Marinated vegetables, or short-term pickles, featuring Western vegetables, including red bell peppers. Ochazuke is a popular way of finishing a meal at an izakaya... there are two main tracks of ochazuke, one of which is the near-literal interpretation of tea poured over rice, with some pickles and furikake as accompaniments. Another is with a soup broth, and this version clearly is in the latter school. As accompaniments, some chopped basil, parmesan, and anchovies are provided; they've been served separately to accommodate my vegetarian habit. I'm wasn't quite sure which herb was used, but I think the rice has been mixed with a chiffonade of parsley along with some toasted sesame. 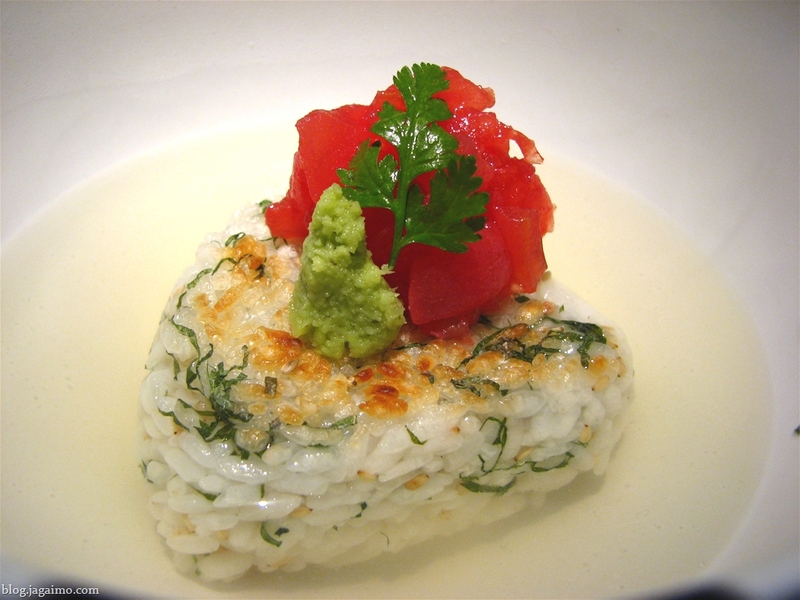 Because the ball of rice is grilled before being incorporated into the ochazuke, the rice ball is called yaki-onigiri. Topping the yaki-onigiri is an earlobe of wasabi. 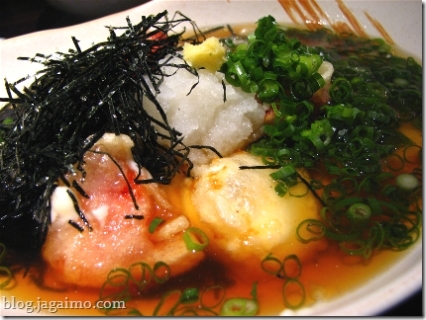 Any number of variations of ochazuke exist. 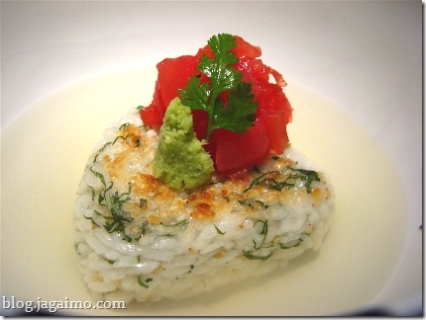 I've made a yaki-onigiri ochazuke before, myself, though with a decidedly more Japanese flavor profile. This dish was really smart. 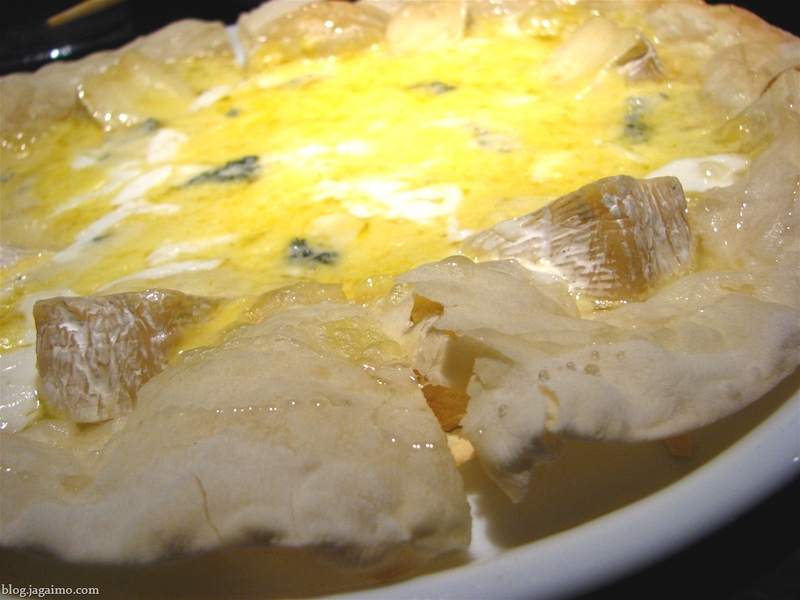 Well balanced and comforting, it avoids most of the cliches found in American "fusion" cuisine while still playing with foreign (to Japanese) flavors. I think it's successful because it's firmly grounded in one culinary tradition, while judiciously adapting ingredients found in another... So many fusion dishes in the US seem to have a poor understanding of all of the source cuisines they are borrowing from. I think I haven't had a chance to have kuriimu anmitsu for quite a while. 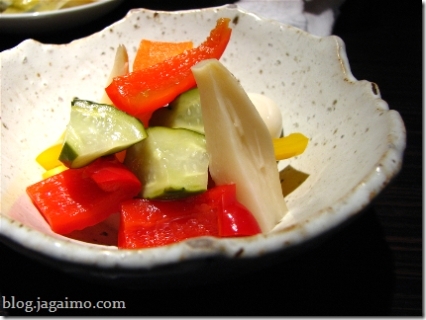 We had a small dish of anmitsu served with a quick set meal at a kissaten in Mashiko, but for some reason, Hiromi and I haven't found our way to any place featuring anmitsu for quite a while. 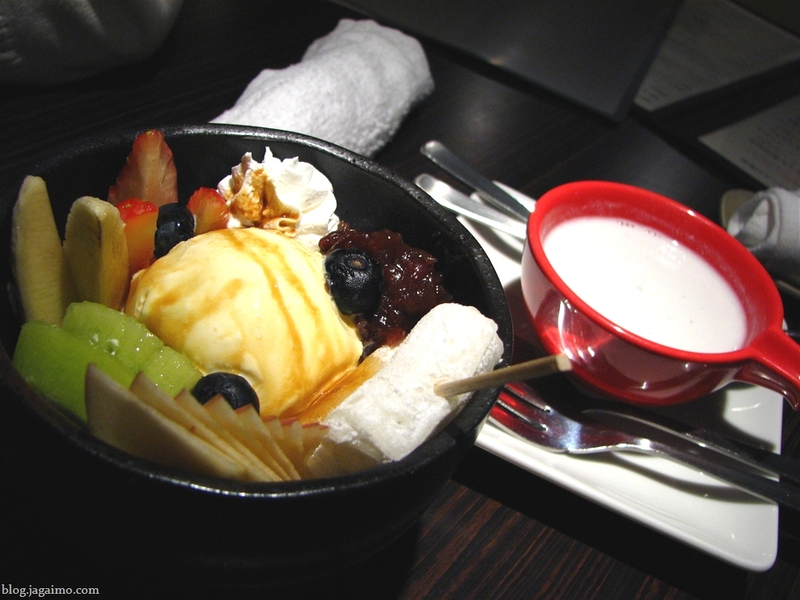 The ice cream version of anmitsu, called cream anmitsu, can be found at old-school kissaten around Japan, but it seems not as easy to find as it was even six or seven years ago. Usually anmitsu comes with fruit, anko (sweet red been paste), and wasanbon (blonde cane sugar syrup), kuromitsu (black sugar syrup) or occasionally a simple sugar syrup. Occasionally the concept is combined with kakigouri, the shaved ice dessert; a few years back I ate that in a little shop in Takayama in Gifu prefecture. We meandered the few dozen meters to our weekly apartment and started halfheartedly attacking our luggage. After our big lunch, we found ourselves at Toraya Cafe, another fancy Omotesando Hills concept restaurant. You'd think that we couldn't possibly have room to eat more. However, to think so, you must be oblivious to the concept of betsubara... literally, separate stomach, the idea is expressed rather verbosely in English as "there's always room for dessert." Toraya Cafe is a contemporary-style wagashi shop... Much like Tsujiri Cafe, from Uji, they reference traditional wagashi (Japanese confectionary) but playfully reimagine flavors and presentations. Toraya, though, is a very old confectionary company, and their parent company is equally adept at old-school and contemporary wagashi. Most of us ordered some sort of beverage, generally some kind of tea. 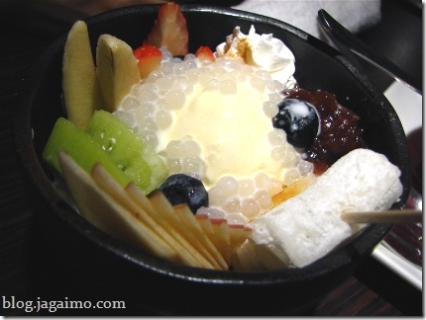 Kristin ordered a "matcha glacé", a sort of sweet matcha drink that doubles as a dessert. I ordered some azuki-cha (roasted azuki mean tea) served cold, with optional wasanbon syrup, a lightly processed sugar cane syrup, as a sweetener. One of the things I love about soy-based foods in Japan, including desserts, is that, for the most part, little effort is made to conceal the soy flavor. In fact, the aroma of the soybean is often intentionally highlighted. Soy is not some sort health food or a second-class milk or meat substitute, but, when suitably fresh, a remarkable flavor all its own. 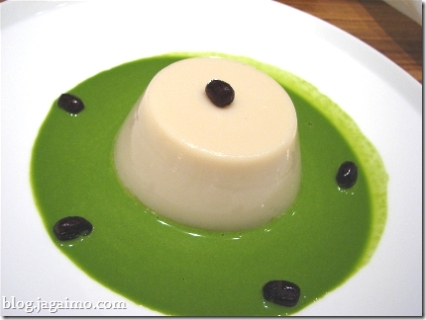 This tounyuu purin, or soy milk pudding, has a pronounced soy flavor and is pleasingly creamy. A thick matcha-based crème anglaise adds a bittersweet touch and contrasts nicely with the soy pudding. Dark azuki beans, slightly sweet, garnish the dessert in the same way you might expect to see in a coffee-based dessert. 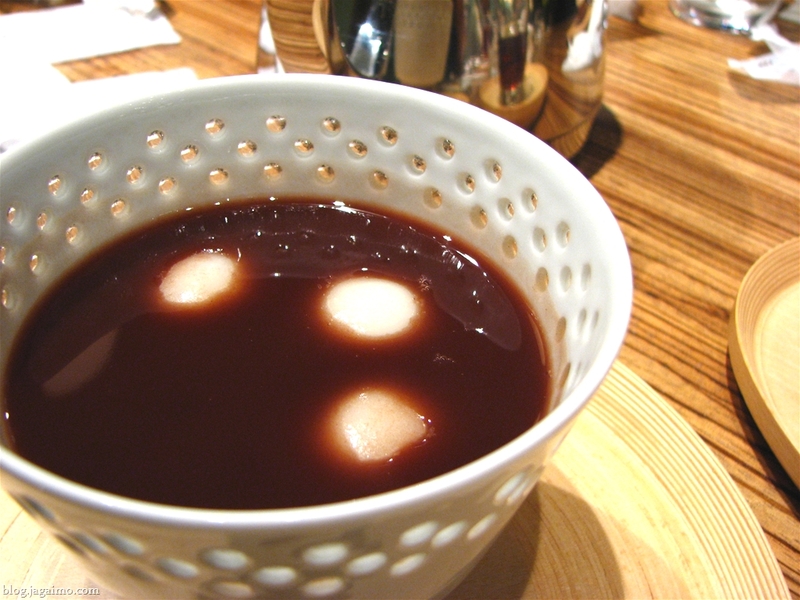 This remarkable variation of oshiruko, sweet azuki soup, is relatively traditional except for one subtle base note: The azuki are simmered with earthy Chinese pu-erh tea. Since azuki already has a somewhat earthy flavor, the flavor doesn't dominate, but provides a pleasant underlying accent that adds a subtle complexity to a dish that normally has a very straightforward, sweet flavor. A few shiratama, also slightly tweaked for this dish, had, I believe, a little accent from white sesame seeds. Although Toraya is a fairly large company, their cafe is, for me, one of the pleasant things that can happen when someone with vision and firm roots in a culinary tradition smartly reinterprets their palette of flavors and techniques with a creative eye. It's not hit-you-over-the-head culinary drama, but it's pleasingly innovative, and worth seeking out.